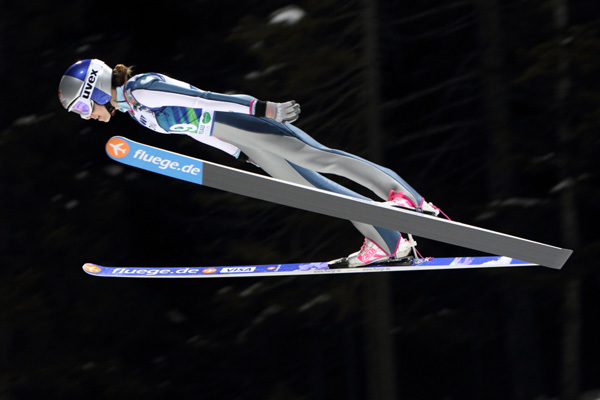 Sarah Hendrickson is the 2013 Women's Ski Jumping World Champion 2014 Sochi Olympian and a member of Women's Ski Jumping USA. For as long as she can remember, Sarah’s childhood weekends were filled with 8 a.m.-4 p.m. ski days with her family. While skiing, every little jump in the run was an opportunity to get some air and take a risk. When her brother discovered ski jumping at age 8 and she was 5, it seemed like the perfect fit. Brother Nick, now a world-class Nordic Combined athlete, started jumping and after watching him for two years, she had had enough and decided to try it. That was just the start. At just 19, Sarah already has broken records. She won a stunning 9 of 13 events on the inaugural World Cup ski jumping circuit in 2012 to become the World Cup Champion. She pushed her way back after summer knee surgery in 2012 to become the second American to ever win a World Championship (March 2013), just four years after teammate Lindsey Van won in 2009. Sarah also is the first American (male or female) to medal at a Junior World Championships — she has a Bronze and a Silver. The highs of the previous season were met with a low point in August 2013 when Sarah suffered another injury during training in Germany. This time to her right knee, tearing her ACL and damaging her MCL. Post surgery, Sarah spent up to 6 hours a day in rehab, fighting her way back and was named to Team USA for the Sochi 2014 Olympic Winter Games. She finished 21st despite pain in her knee and said she took great honor in being the first woman to get to jump in an Olympic Games, thanks to having bib No. 1. Sarah also is a talented soccer player and loves to alpine and tele ski. But her favorite feeling in the world is skiing down the in-ramp going 60-plus miles per hour and flying as far as she can.